Memory Lane Cafe have a pop-up Christmas Shop again. 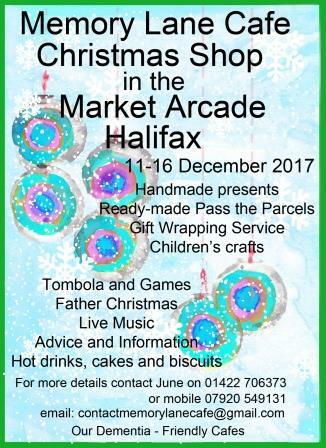 This year the shop will be running from Monday 11 December to Saturday 16 December in the Market Arcade where the Upstairs, Downstairs Cafe used to be. There will be hand made presents as well as lots more happening with Father Christmas, tombola, games and refreshments. See more by clicking on the poster to the right.